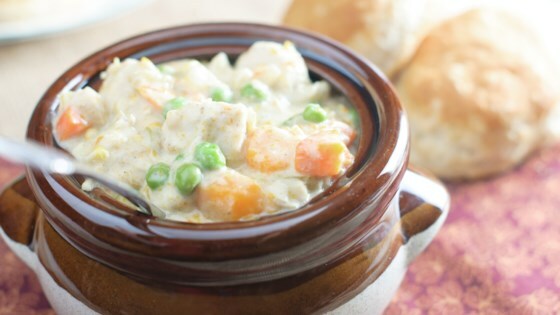 "Make this delicious, flavorful, chicken pot (no pie) pie in your Instant Pot® pressure cooker. Not necessary to pre-saute the chicken or onions. No crust, wheat free, gluten free. Serve in bowls." Combine chicken, broth, carrots, celery, corn, onion, salt, garlic powder, onion powder, black pepper, poultry seasoning, and thyme in a multi-functional pressure cooker (such as Instant Pot(R)). Close and lock the lid. Select high pressure according to manufacturer's instructions; set timer for 10 minutes. Allow 10 to 15 minutes for pressure to build. Release pressure using the natural-release method according to manufacturer's instructions, about 10 minutes. Release remaining pressure carefully using the quick-release method, about 10 minutes more. Unlock and remove lid. Stir in cream and peas. Select Saute function. Cook until thickened, 2 to 3 minutes. This easy, ingenious method makes delicious pot pie like a slow-simmered stew. Very easy and tastes great. The only change I made was to add tiny pasta and an extra cup of broth to make it a thicker soup. Will make again. Five stars, no doubt—not only delicious but also simple to make. Yes, one must add flour or cornstarch; mushrooms would be good, as well. Nonetheless, this is a solid five-star recipe. Thank you!